REWIRE is a European Project funded by the Seventh Framework Program, that develops, integrates and field tests an innovative virtual reality based rehabilitation platform system based on a multi-level rehabilitation platform. REWIRE pursues to create a Personalized Health System that can be deployed massively at the patients’ homes, enable home-based effective rehabilitation to improve disabilities and functions. REWIRE is aimed at patients, discharged from hospital, who need to continue rehabilitation. The idea is to provide them the possibility of continuing the rehabilitation at home under remote monitoring by the hospital. - Patient station (PS) is deployed at patient's home. It guides the patient through the rehabilitation program by a set of mini-games shown on the TV screen. Patient's motion is tracked by video based systems (hands-free paradigm) and the level of challenge is tuned to patient's current lifestyle measured with miniaturized with adequate dressed devices. - Hospital station (HS) is used at hospitals by the clinical staff to define the rehabilitation treatment by scheduling a program of exercises personalized to each patient, and monitoring the patient's progression through the analysis of the motion data sent back by the PS. HS supports also a patients' community to further support at home. 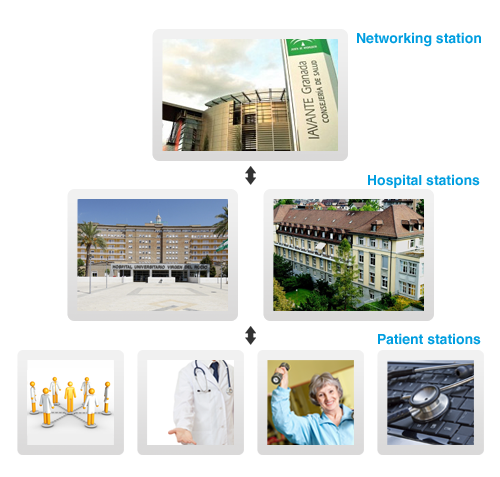 - Networking station (NS) collects valuable data related to rehabilitation while the patient is both in the hospital and at home.